Chart.js can display your data in form of line charts, bar charts, radar charts, pie charts, polar area charts, and donut charts. The library uses HTML5 Canvas to display the graphs and has polyfills for IE7/8. 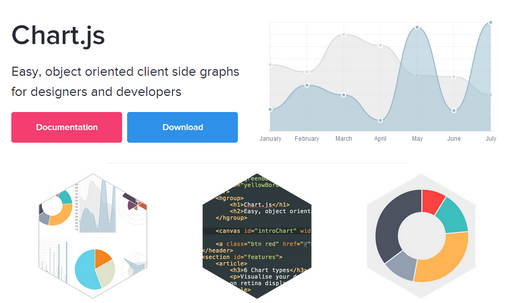 Chart.js is also very lightweight and dependency free, weighing in at only 4.5KB (minified & gizpped). You can navigate through the tour using mouse and keyboard shortcut keys. The library makes use of overlays and popups to focus the user’s attention to the proper part of the page being toured. 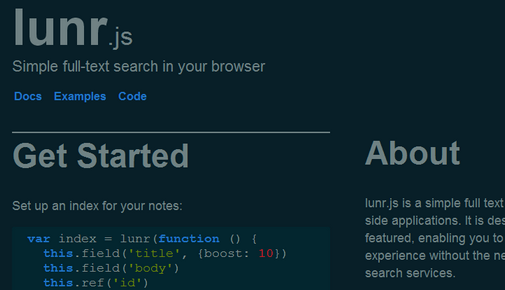 Intro.js is lightweight, weighing in at 7KB, with #KB of CSS code. 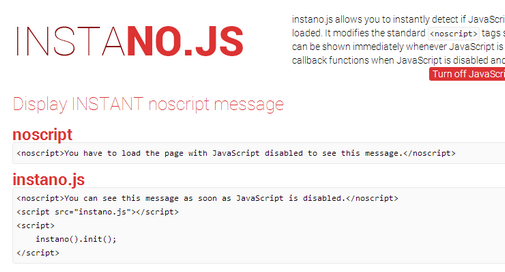 Intro.js is supported in all modern browsers, including IE8+. The library updates the counts in real-time and is very easy to use. Countable.js might find application in areas where text length limiting is necessary, such as comment length, description length, etc. lunr.js also has inbuilt filtering of stop words, which are common words in search queries which do not affect the way pages are retrieved. SPOILER ALERT! 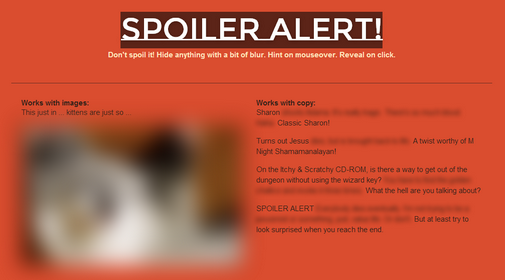 is a jQuery plugin which uses blurs to hide spoilers from readers online. However, SPOILER ALERT! adds some more bells and whistles to the concept by enabling you to specify maximum blurs and partial blurs. Maximum blur is used to hide the spoilers completely from the readers. However, upon hover, the partial blurs are applied which makes the content a bit more distinguishable. Finally, clicking upon the blurred content fully reveals the hidden material. SPOILER ALERT! can not only be used for blurring out spoiler texts, but can also be used for images. This technique for hiding spoilers is a nice change from the usual blacked out or completely hidden text we usually find on website as it keeps the flow of the content essentially the same. It then shows which errors are found in the code along with with helpful hints on the nature of the errors. 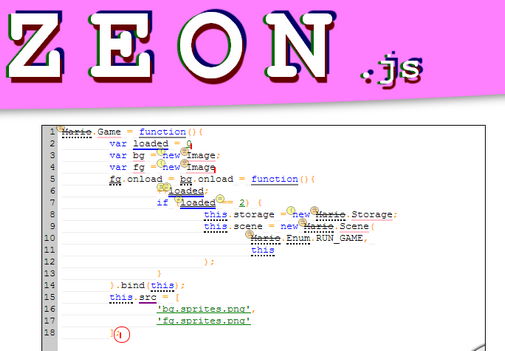 ZEON.js could be a useful learning tool as well as a good tool for quick prototyping. Additionally ZEON.js allows you to minify the code displayed in the textarea and beautify it on the fly too. You just need to supply an image and the library will compute the RGB values of the image as well as well as it’s brightness. 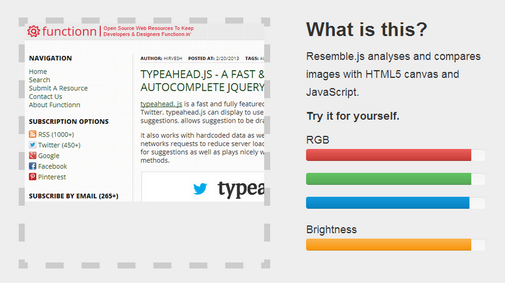 With Resemble.js you can also perform comparison between two images easily. You can ignore colors and antialiasing while comparing the images, with Resemble.js giving you a true or false on whether the images are same or not. Emblem.js is a new templating language which compiles down to the popular Handlebars.js templating engine. Emblem.js is an indentation based templating language, similar to Slim, Jade, HAML, etc. It compiles to Handlebars; full compatibility with both custom and built-in Handlebars helpers. 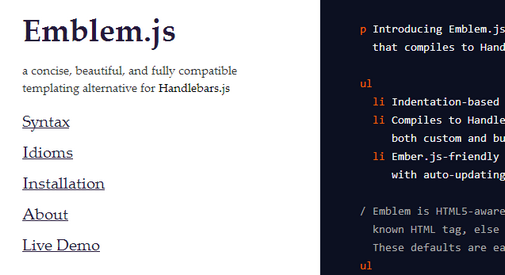 Emblem.js is also has Ember.js-friendly syntax and full compatibility with auto-updating functionality. 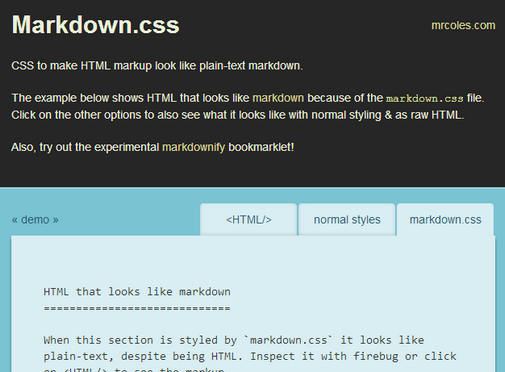 Markdown.css is a CSS stylesheet which allows you to display your normally rendered HTML text in Markdown syntax. Markdown.css also comes in as a bookmarklet which enables you to apply it on any webpage so as to generate markdown code from it. This might be useful if you need to copy and paste some text with formatting in a Markdown editor (like at StackOverflow). You can check out Markdown.css below. PeerJS deals with the WebRTC handshake and allows connection by peer ID. However, to establish a connection, you need a PeerServer. This is written in Node.js and you need to set it up. No data passes through the server – it is only used to broker the connection between peers. With w2ui you get a very well integrated set of UI components, which weight in at only 37KB (minified and gziped). w2ui makes extensive use of HTML5 and CSS3 making sure it supports latest browsers. w2ui works in Chrome, FireFox 7+, Safari 5+ and IE 9+ are among supported browsers.